Combat hair loss and thinning with the Nourkrin Man for Hair Preservation 6 Month Bundle with Shampoo and Conditioner; a six month supply in a convenient value pack. The bundle boasts daily supplements that support the hair growth cycle, alongside a shampoo and conditioner, which further discourage loss and thinning. Healthy hair growth is supported and promoted. 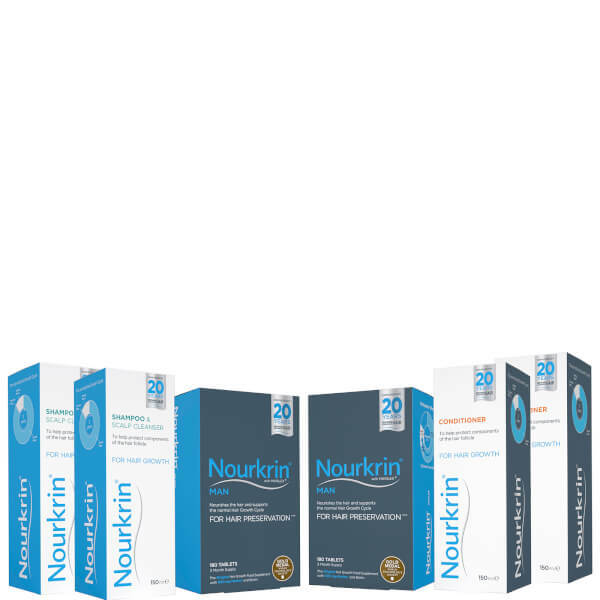 Discover a safe and drug-free approach to hair preservation with Nourkrin Man; a daily supplement designed for men facing the prospect of hair loss and thinning. The tablets seek to support, normalise and maintain the natural hair growth cycle by providing the correct nutrients to the follicles. The supplements contain Nourkrin’s exclusive ingredient Marilex®, Acerole Cherry Extract and Fenugreek, which work in synergy to provide the scalp with Vitamin C, A, B1, B2 and B3. The addition of Cod Liver Oil Extract offers a dose of Vitamin A and D. Finished with D-Biotin, Nourkrin Man is able to contribute to the maintenance of normal hair. With continued use over a six month period, the supplements strive to restore the hair growth cycle to normal, which promotes strong and healthy hair growth, whilst discouraging thinning and loss. The Shampoo and Scalp Cleanser is a gentle yet effective formula that helps create an optimum scalp environment to support healthy hair growth. Scientifically formulated, the solution gently cleanses away dirt and impurities whilst protecting components of the hair follicle. Its protective and stimulating properties help to improve the scalp environment and increase the appearance of hair volume. The Conditioner is clinically created to provide support for thinning hair and to help combat hair loss. Gentle enough to use every day, it’s a hair loss solution that will boost follicle strength, and your confidence. The lightweight formula provides gentle nourishment whilst making your hair soft and easy to comb. Specially formulated for damaged hair to contribute to re-growth of problem scalp areas. 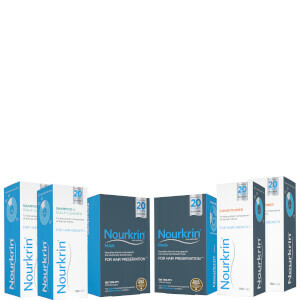 For best results it is suggested that a combination of Nourkin Extra Strength or Nourkrin Man Tablets are used in conjunction. Champú: aplicar sobre el cabello mojado. Masajear bien sobre el cuero cabelludo y el pelo. Dejar actuar 2-3 minutos. Aclarar con abundante agua. Adecuado para todo tipo de cabello, incluido el cabello frágil y delicado. Adecuado para el uso diario. Usar la gama completa de suplementos, loción para el cuero cabelludo, champú y acondicionador de Nourkrin® para obtener mejores resultados. Acondicionador: después de lavar el pelo con el champú de Nourkrin, masajear el cabello y el cuero cabelludo con el acondicionador de Nourkrin. Dejar actuar 2-3 minutos y aclarar bien con agua. Suplementos: tomar dos comprimidos a diario durante 6 meses (1 comprimido por la mañana y 1 comprimido por la noche preferiblemente acompañado de un vaso de agua después de las comidas).